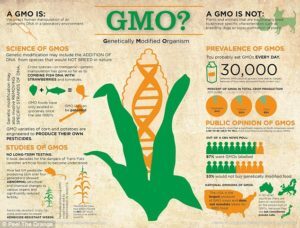 The vast majority of corn and soybeans grown in the US are genetically modified organisms, or GMO’s. This means that the genes/traits of another organism (in most cases, genes from bacteria) have been inserted into that of the corn or soybeans to improve the plant’s ability to survive and prosper. This, in itself, is a great leap forward for science and its ability to improve sustainability of corn and soy crops. When you admire those corn and soy fields that are weed free, identically green, very close together, and uniform across acres and acres of land, we have science to thank for this bounty. Corn and soy are more reliable, higher yielding and more cost effective to grow than they have ever been. GMO’s are not the same as hybridized plants. Hybridization is the cross breeding of one varietal of plant to another in the same species. Often, one varietal of corn performs better in certain climates or has a shorter, sturdier stalk that can support the weight of a larger yielding ears or seed heads. Cultivars (or cultigens, cultivars aided by human activity) are produced by cross breeding two varietals. This is basically forced evolution. Both GMOs and hybrids are ways of creating a stronger plant that will perform better in the field. The argument that GMO’s are bad for you is often weak. There is nothing terrifying about corn that has been genetically modified. The seed is not the bad guy. It is just a kernel of corn. The real issue, which is so often glossed over, is the CONSEQUENCES that come from overuse and over-reliance on these successful products by farmers across our country. In the past, before laboratories and corporations controlled so much of farming, a farmer would grow crops that he/she cultivated from year to year. The natural selection that took place was due to a farmer selecting a higher yielding varietal of corn for his/her region and rainfall expectations and choosing the heartiest of those plants from which they’d save seeds to replant the following year. This is not to say that no one saves seeds anymore. You cannot save patented seeds, however. This is Mansanto’s rationale for maintaining the right to sue farmers for reusing their highly successful seeds- https://monsanto.com/company/media/statements/saving-seeds/ This creates a reliance on your seed source that did not exist before. That same source is providing the farmer with the weed-killer that the plants are resistant to. The plant is not cultivated to do well in the farmer’s town or region, it is going to do well in most conditions. This is how a region loses its bio-diversity. Each farm is growing the same seeds and though they are performing well now, there is no local cultivation of crops to perform better in certain areas that have specific concerns for the region, such as specific pests or soil conditions or rainfall amounts. If you have less rainfall, just irrigate and draw more water from the aquifer. If you have soil that lacks nutrients because your corn drains it from year to year, just purchase more fertilizer. If you can’t seem to make enough money from your crop, just plant more acreage. Today, corn and soy are so much more productive than other crops that farmers choose to rely on them almost entirely. This was not always the case. Regions of the country were specialized for certain crops. Rye grows better in cooler northern, rocky, less fertile areas. Soy tended toward northern, fertile soils. Wheat does better in warm climates (but not too warm) with 12-15 inches of rainfall the during growing season. Barley is a temperate climate plant. 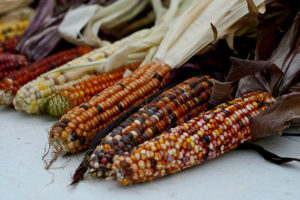 Corn, historically, thrived in warmer, southern regions and each locale had its own style of corn/maize. Different areas of the country grew different types of plants that thrived in each nuanced microclimate. This is not to say that these realities do not still exist, it is just far more likely that corporate farms will choose to grow their large crops in areas that are more easily manipulated. A drier, midwestern climate is ideal for many crops that can be maintained by sprinkler systems and customized fertilizations. If you fly over the Midwest of the US, you will see the many circles of green in an otherwise taupe environment. This is due to the sprinkler systems that pivot from a central point like a clock dial. Controlling your rainfall with groundwater and adding fertilizers where they are needed is ideal for controlling predictable crops, but it tends to neglect nature’s water table and add extra nutrients to local bodies of surface water, choking them with algae and killing fish and waterfowl populations. Nature works in mysterious ways, but bio-engineered crops do not. Business loves predictability. Unfortunately, nature is not predictable. Nature and farming have battled each other since the dawn of civilization. Somehow, corporate farming believes they have the answers to civilization’s quest for dominance over agriculture. 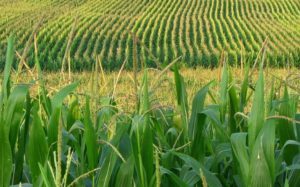 Every year, they are proven wrong with drought, flooding, climate change, invasive insects, stronger and more resilient plant diseases, and heartier weeds that have evolved to resist even the most weed-resistant GMO crop. It is the height of human vanity and arrogance to think that a few tweaks in the genetics of a plant will solve world hunger or make farming simple. Different varietals of corn that do not produce near the amounts that GMOs can. They are now considered heirloom or heritage grains. It is often said that “they are heritage for a reason” because they are no longer profitable crops for local farmers. siness owner and entrepreneur, part inventor, part plumber, woodworker, skilled tradesman, and mostly…exhausted. Each year, less people choose to take on the Herculean task of running a farm and who can blame them? Those that have survived grow that GM corn because it is more predictable and easy to sell in bulk. Who can blame a farmer for growing a crop that they know will help keep their farm productive and viable? GMOs and the loss of the integrity of the local farm has cost our country more than can be quantified. Our disconnection from our food, our disinterest in what makes our region special, and our disregard for farmers (often calling them fools for continuing to work their land) is a tragedy for our country. Is a bowl of cereal made from GMO corn going to kill you? No. There is nothing evil about the seed that was grown with the aid of science. It is innocent in all this. Will the companies that continue to use our nation’s land and water irresponsibly going to profit from keeping us happy and ignorant? Will farms continue to disappear because they just can’t compete against a growing trend toward consistency, predictability and consolidation? Will a farmer choose to grow a crop that doesn’t produce as much final product to sell? Will they ever go back to growing organically (in any way) when it costs more and is more difficult to maintain organic crops? What do you say to your local farmer when they spray those toxic Round Up pesticides that have become as much a part of their farming practice as their GPS driven combine? Technology doesn’t have to hurt farming. It just seems to me that the more we treat farming as a solvable problem, the more harm we do. The wisdom that generations of farmers have gained is being lost. The crime of GMOs is not in their seeds, it is in their hubris.